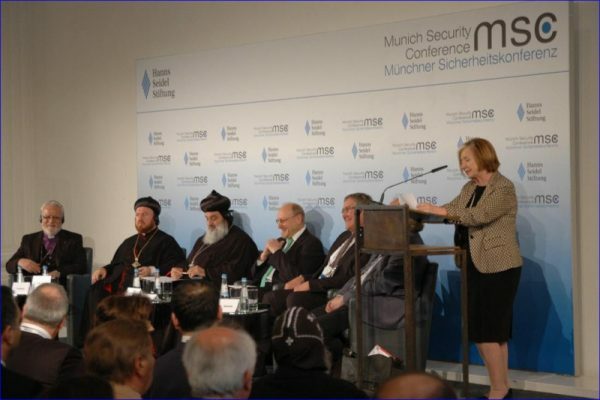 The future of Christians in the Middle East was the subject of a panel discussion at the Munich Security Conference, held on 17-19 of February. Organised by the Hanns-Seidel Foundation, the panel was titled ‘What future do Christians have in the Middle East?’ and focused on the situation of the churches in Syria and Iraq. The panel was chaired by Professor Ursula Männle, Minister of State. Speakers included Patriarch Ignatius Aphrem II of Syriac-Orthodox Church, Dr HC Heiner Bielefeldt, formerly UN Special Rapporteur on Religious Freedom and Belief, Dr. Franz-Josef Jung, Commissioner for Churches and Religious Issues of the CDU/CSU Parliamentary Group and former Defence Minister, Nicodemus Daoud Sharaf, Archbishop of Mosul, and Archimandrite Emanuel Youkhana, Chairman of Christian Aid Program Northern Iraq (CAPNI) of the Assyrian Church of the East. Professor Männle said that the humanitarian catastrophe in the Middle East is the largest we face since World War II and Christians are particularly targeted; they are at the verge of losing not only their homeland but also their identity. She pointed to statistics of people impacted in both Syria and Iraq. Prof. Heiner Bielefeldt noted that human rights are nowhere violated as dramatically as in Syria and Iraq, and asked for the public “outcry instead of a private anxiety.” Dr. Franz-Josef Jung saw a duty of the West in the fact as its Christian cultural imprint demands more European commitment in the region. Archbishop of Mosul, Nicodemus Sharaf, described the catastrophic situation on the ground and placed a particular focus on the hopeless situation of the refugees in northern Iraq while blaming the West for failing to create a “save zone” for the Assyrians in the Nineveh Plains. Archimandrite Youkhana pleaded to give hope to Christians in the Middle East so that they could stay in their homeland. The Patriarch described the current situation and living conditions of the Christians in Iraq and Syria. The hopeless situation, as he said, is reason for many Christians to migrate. Hence, the Christians presence is dwindling. Below are excerpts of the Patriarch’s remarks (transcribed by Sarah Abed).